One way to achieve this is by adding custom features to your pool. An infinity edge is one such feature. If you don’t already know, an infinity edge pool is a swimming pool where the water flows over one or more edge producing a visual effect of water with no boundary. They’re often seen at high-end resorts—but they can definitely be added to a backyard pool. The way that an infinity edge pool works is that its wall slopes downward (away from the pool) to create the illusion of dropping off and to form a waterfall. The water falls into a catch pool below, which is a basin that sits beneath the edge. This water is pumped back into the main pool. Of course, as with any custom feature, that’s going to raise the price of the overall project. If it’s a feature that you’re seriously considering, then you may want to know how much does an infinity pool cost? Like any other project on your property, you probably know that under-investing is going to result in a finished project that may not fully live up to your dreams. But you also want to have an understanding of what you’re investing in before you take the plunge. We’re not ones to skirt around an issue or try to hide information so we will be upfront in telling you that adding an infinity edge is a serious investment. To give you some sense, an infinity edge can add around 20 to 50 percent of the total cost of the pool to the overall price of the project. For instance, if the pool portion of your backyard landscape design project comes in at $80,000, adding an infinity edge could easily increase this project feature to $90,000 - $120,000 depending on various factors. But it’s an investment that can really take your pool to the next level, so it may be well worth it to you..
Of course, you might be looking to understand why it costs what it does. The simple answer is that designing and building an infinity pool is a complex process. By adding an infinity edge, you add quite a bit of time, material, and labor to the overall project. For one, it’s a very “engineering-intense” project. Additional engineering is going to be required in order to support the structure being built at the pool’s edge. Once the construction phase begins, that’s more involved as well. It’s basically like building two separate pools. The additional “pool,” which is really the basin the water catches in, requires its own materials and equipment including additional gunite, tile, and additional pumps and electrical. Plus, all of this also requires additional labor. 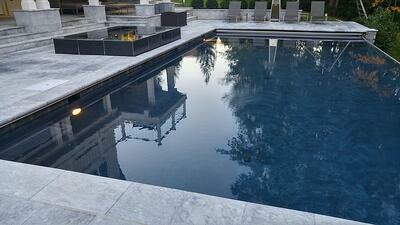 A lot of times when homeowners add an infinity pool, they also choose to create additional finished space. In addition to the patio area you create around your main pool, you could potentially also add a patio area several feet below, where the infinity edge’s waterfall drops off. Some homeowners use this as a more secluded hang-out spot where they can enjoy the sound of running water. It might be nice to add a couple of lounge chairs and a fire feature to this special area. 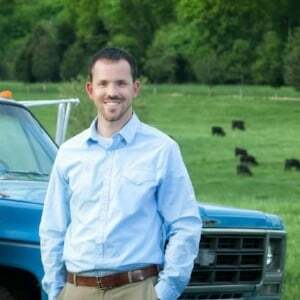 So far, the costs that we’ve discussed have been for a typical situation with a typical yard. But what can make the infinity pool price go even higher is a property with a very steep slope. Of course, this is the very type of property that could greatly benefit from an infinity edge. But it can make the engineering involved in supporting the pool quite complicated. 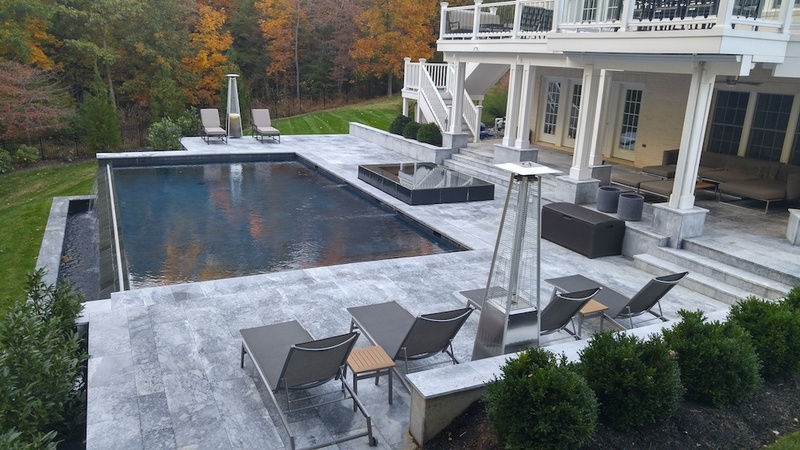 Adding an infinity edge pool to a property with a steep slope can make the cost of the infinity edge increase as they require more involved engineering than a typical pool construction project. But those who have added this type of pool to their unique property have said they have no regrets. After all, if you live on a property with a unique view and have a hillside or mountainside that overlooks a river or lake, a valley, or even farmland, then creating a pool that goes right up to that edge could be truly extraordinary. It’s that “priceless view” that everyone is after. Lounging in your pool while overlooking the scenery makes the entire experience that much more enjoyable. One way that you can have the aesthetic benefits of an infinity edge without the full-blown cost is to just create one on a corner instead of the full edge. This would still give you a unique aesthetic addition and the sound of running water, but for less expense. Following our previous example, that $80,000 pool portion of your project could be somewhere closer to the lower end of that $90,000 - $120,000 range if only a portion of the edge had the infinity effect. However, one consideration is the fact that while we can still install an automatic cover on a pool that has a full infinity edge, we cannot install an automatic cover on a partial infinity edge. It’s also not going to give you the same dramatic effect that you’d have with a full edge. In the end, you have to weigh whether it’s worth the extra investment to have the complete look. As you think about adding a new pool to your property, you must keep in mind that there is so much more to a pool than just the structure itself. There are certainly pool companies out there that will throw in a cheap pool and move on. These types of companies are the same that are trying to install as many pools in a season as they possibly can. But these same companies fail to put together a complete outdoor living area which is what you’ve likely envisioned (and will most likely end up paying for in the year to follow). In addition to wanting the full package, you must also think about the fact that your average pool company may not be equipped to install an infinity pool. With the high level of engineering and expertise required for this type of pool, you don’t want to risk something going wrong. An infinity pool failure can be a disastrous financial mistake leaving you to regret working with someone who cut corners. For these reasons, it’s critically important that you choose the right company for your infinity pool. After all, we believe that it’s not just about the pool that you’re building but about the memories that you will create there—and you want them to be as spectacular as the space. 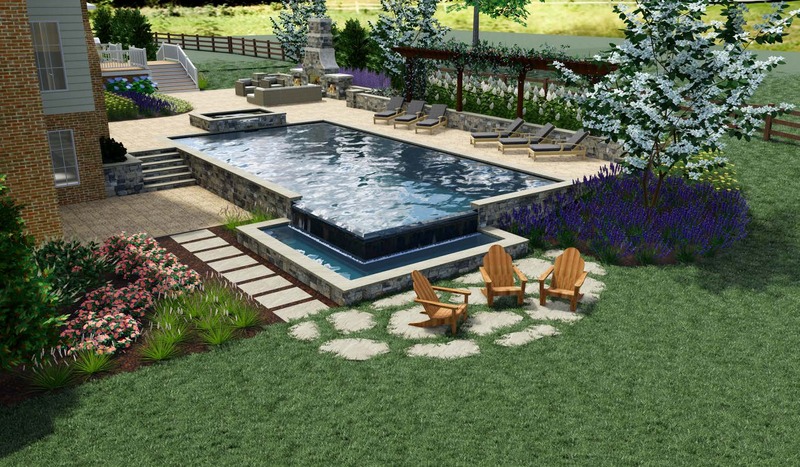 At Rock Water Farm, we have experience and knowledge designing and installing infinity edge pools as well as complete pool spaces that can truly be used and enjoyed to the fullest. When it comes to a big dream like a resort-style pool, you don’t want to take any chances that your dream won’t live up to its potential. You deserve to have the luxurious backyard that you desire.